City Life Video Slot Guide & Review - Casino Answers! 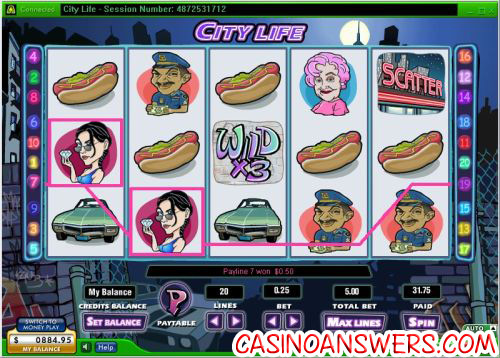 City Life is a 5-reel, 20-line video slot from Random Logic, featuring wild substitutes, scatter wins and a bonus game. You can play the City Life video slot at Littlewoods Casino and Lucky Ace Casino. City Life is a city street themed video slot, consisting of very shady characters such as a corrupt cop, a gangsta DJ, a madam, a thief and a businessman. The video slot’s background graphic is a view of the city at night with lots of buildings and graffiti. Funky music will play while you spin the reels and continue whenever you win. There is a ticker that is below the game reels that will display lots of tips during gameplay, which is a welcome inclusion. To play the City Life slot machine, first set your bet per line. Available bets are $0.05, $0.10, $0.25, $0.50, $1, $2, $5 and $10. The total bet range on the City Life video slot is $0.05 to $200 per spin. You can also change the number of active paylines in the game, although recommend leaving it at 20 for best results. The most valuable symbol on City Life is the scatter symbol. You can win up to 500X your total bet 5 scatter symbols appear on City Life’s reels. You only need two scatter symbols on City Life to pay out. The highest non-scatter symbol jackpot is the Mr. Jobs symbol, worth 1500X your bet per line. All symbols pay left to right on consecutive reels, except for the scatter and bonus symbols. The wild symbol will substitute for any symbol except for the scatter and bonus symbol. There is also a 3X wild symbol that will multiply the winnings of a winning combination it completes by 3X. The 3X wild symbol only appears on the third reel. Wild symbols do not pay out by themselves. All symbols pay left to right on consecutive reels of an active payline, except the bonus and scatter symbols. All wins are multiplied by the credits bet per line except bonus and scatter wins, which are multiplied by the total bet. Scatter and bonus wins are paid in addition to payline wins. Only the highest win is paid on each of the active paylines. City Life has an autoplay mode that you will find in the bottom-right corner of the game screen. You can play up to 99 autoplay spins and stop at any time. Autoplay spins will pause whenever a feature is triggered. The city street theme is one we don’t feel is touched on enough in video slots, so it’s nice to see that here in City Life. We also appreciate how each character has their bonus game, even if each game has the same identical concept. The 3X multiplier wild symbol is also very nice and led to us getting some big wins on City Life. To see if you can get some big wins on City Life, you can get a 100% up to £100 signup bonus at Littlewoods Casino! Are US players able to play the City Life video slot for real money? US players are not able to play at Random Logic online casinos for real money. However, we recommend they try Caribbean Gold Casino, which is US-friendly and has many of the same games available. What are the rules to the City Life slot machine bonus game?